Made by: Voyageur media group Inc. for Kentucky Heritage Council. Authors: Voyageur media group Inc. for Kentucky Heritage Council. Voyageur media group is a nonprofit that creates public media about science, history, art and culture. 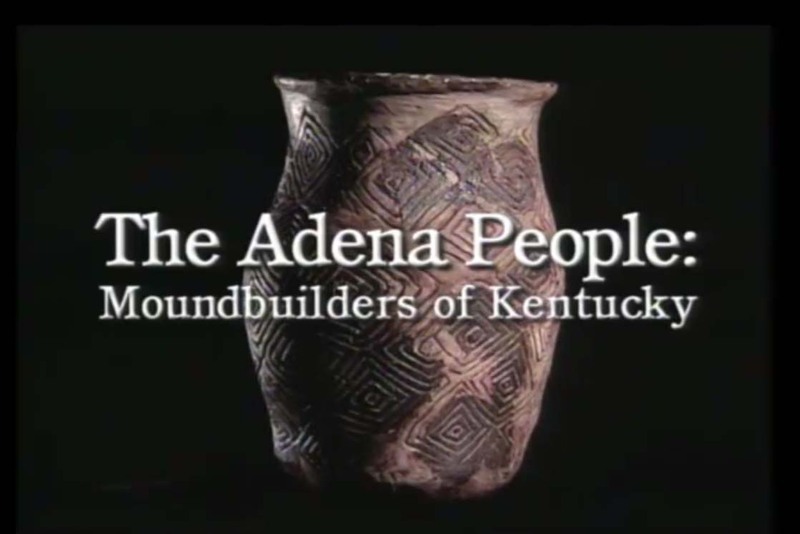 They have several videos about Kentucky archaeology, and I’m guessing I’ll get to watch a few more before I’m finished. Ohh, dynamic opening title with a rockin’ beat! Artifacts are interesting! Archaeology is great! Then…we segue into flute music and a pot rotating in deepest black space. Our very authoritative, unnamed male narrator describes the whirling, whirling artifacts and we are awash in pottery! mica! stone! Lovely things, really. They are, we are informed, legacies of the Adena People. There are burial mounds all over northern Kentucky and we get a fair sampling of them, including two-story tall Gaitskill Mound. 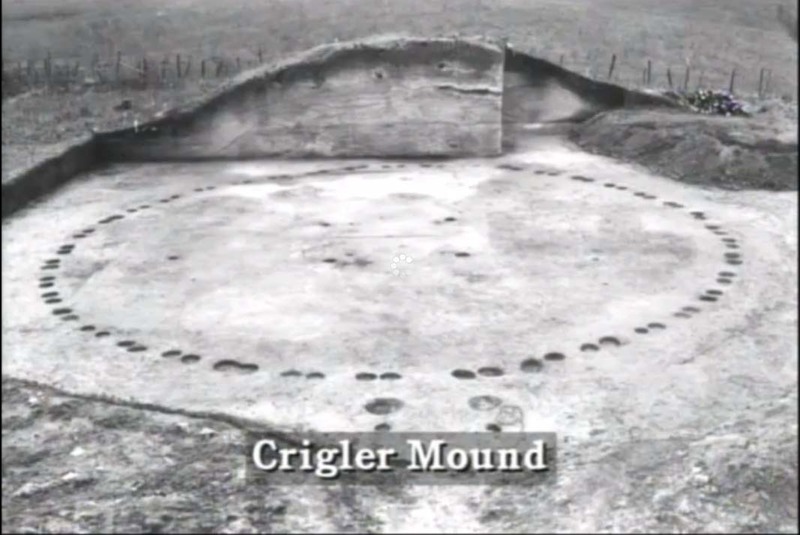 The mounds are constructed over the remains of wooden ceremonial structures–there’s a great b/w photo of Crigler Mound showing this very explicitly–postholes, section, oh yeah. “Some people imagine it’s a Kentucky Stonehenge, or wood henge, with poles.” Hey, who is that guy? 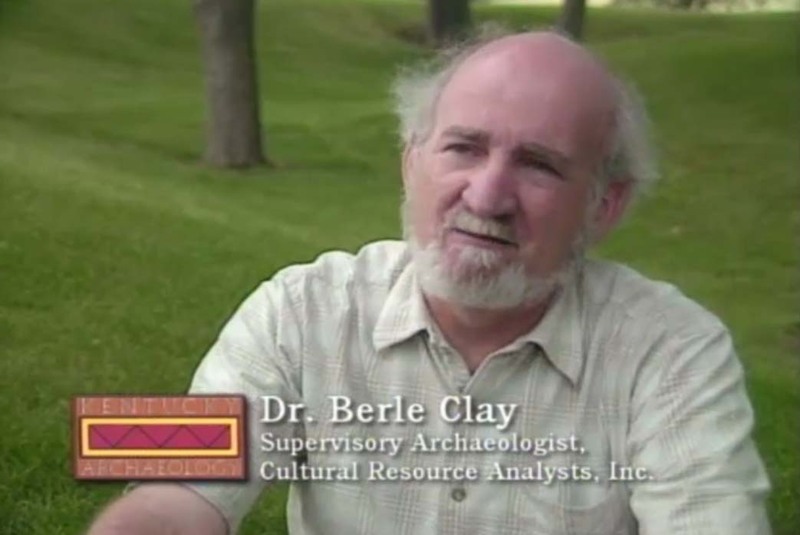 White dude with beard, honey of an accent…must be an archaeologist. 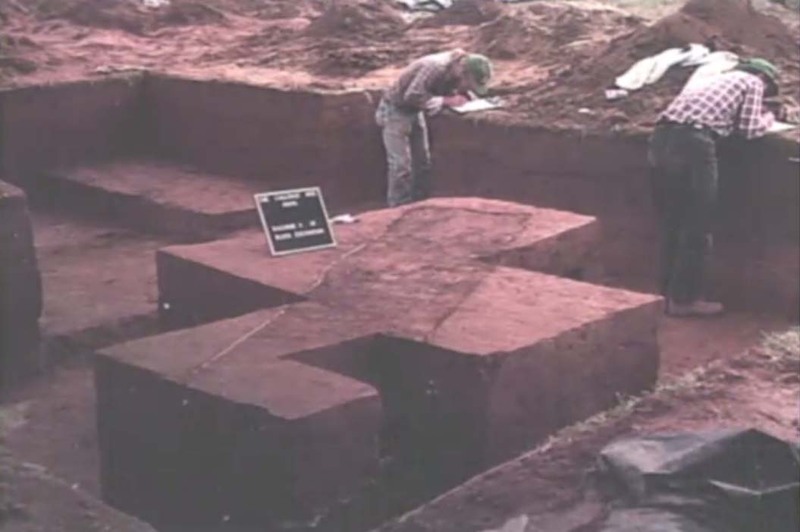 It’s Dr. Berle Clay, telling us that the geometric earthworks may be where clans met. But he equivocates at the end, saying we don’t really know. Fine. OH! 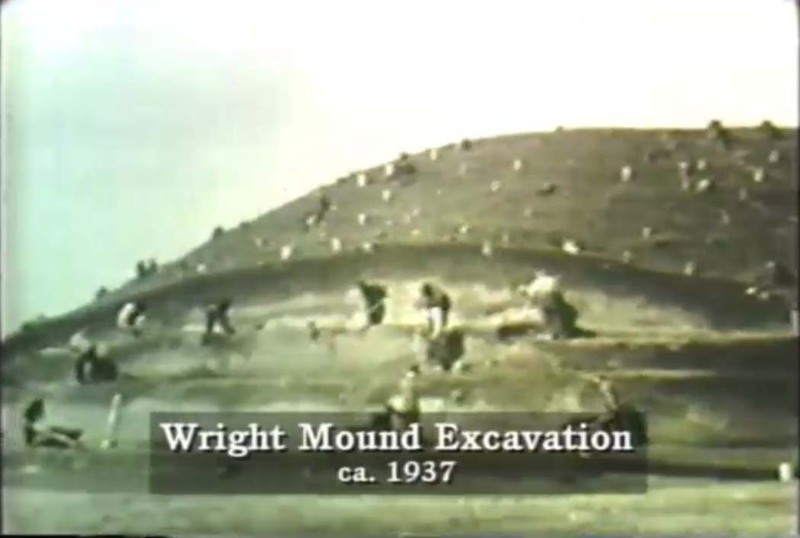 Ohhh, it’s old footage of the Wright Mound WPA excavations! 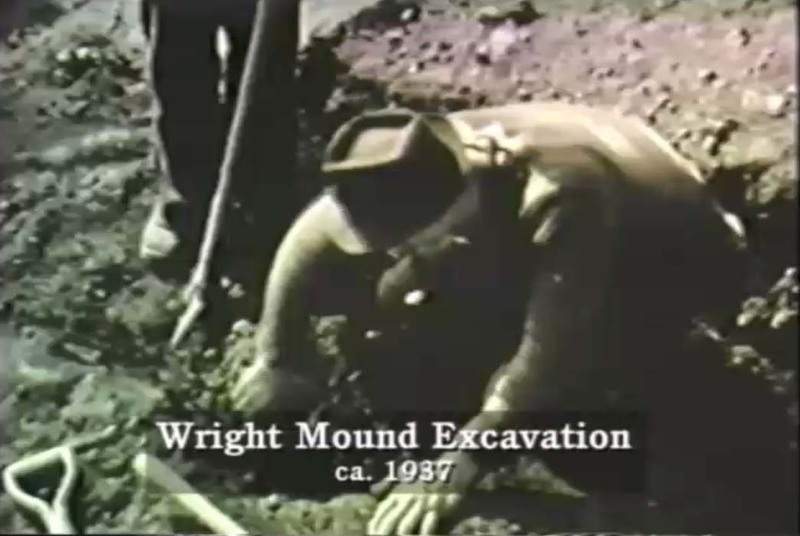 A guy in a hat smoking a pipe while he digs, be still my heart! My day has been made. More! More! LOOK at that pipe. Just look at it. Oh, we’re back to arrowheads. And an unnecessary timeline with an overly complex woodgrain background. There’s some nice reconstructions though, and Dr. Clay is back to tell us a few things we know about their funerary ceremonies. Apparently we don’t know a lot about the Adena because they didn’t live next to their mounds and we mostly liked to dig the mounds, as per typical of the archaeologists’ MO. These settlements have probably been destroyed by plowing anyway, we are told. 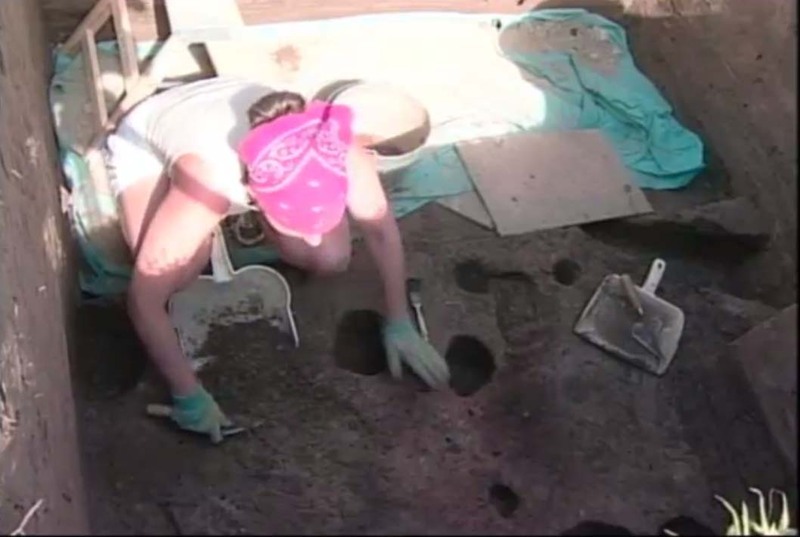 There’s a female archaeologist troweling! Though she’s voice-less, and filmed from top-down. TELL US WHAT YOU ARE DIGGING! Dr. Clay steps in to provide a general explanation, not really about what looks like a rodent-holed mess that poor young woman was dealing with. A bit disappointing. Quick shot of a crazy geometrical configuration that archaeologists have excavated for some reason. What is that big cut in the middle? Follow the archaeology?? Why have you pedestalled something that was cutting a surface? Madness. I guess at least the sections are straight. 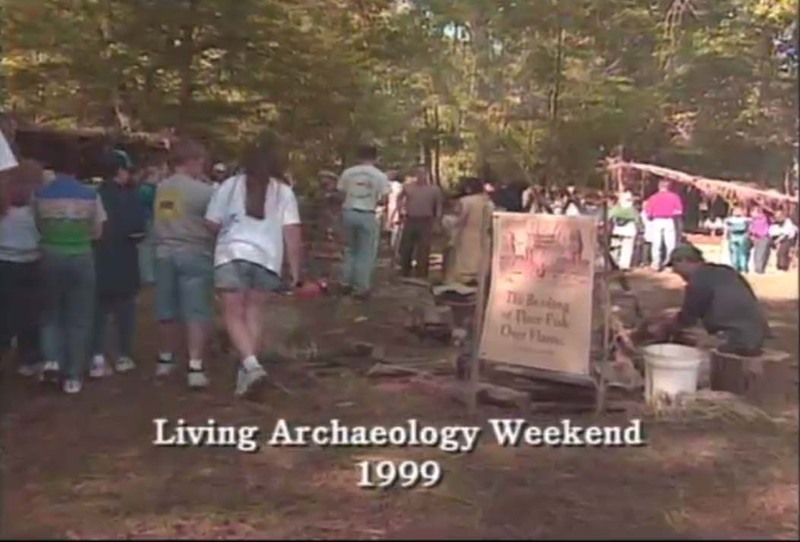 Overall, a good mix of footage gleaned from archives, an interview from a real-beardy archaeologist, landscape shots, artifacts, experimental archaeology, and excavation. A solid introduction to the Adena, if a bit masculinist and lacking in Native American perspectives. Definitely the funniest review of a documentary about the Adena moundbuilders of Kentucky I’ve ever read.